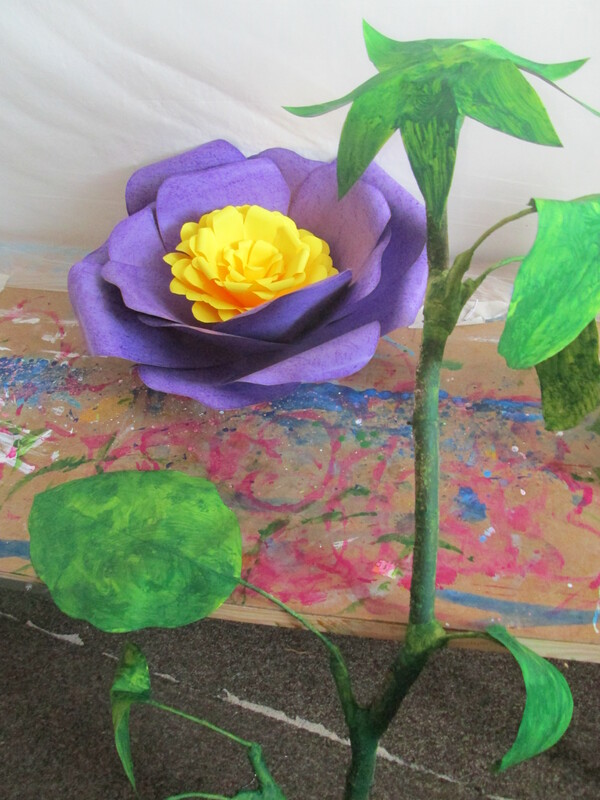 A4 sheets of green card in chosen colour for leaves and flower base I used one A4 as the largest leaf. 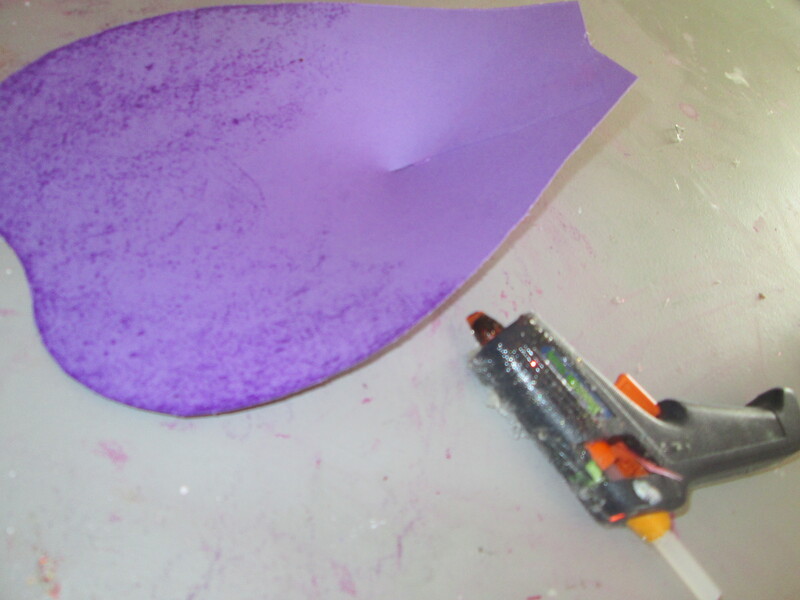 Large wax crayon in chosen colour to add texture if desired. 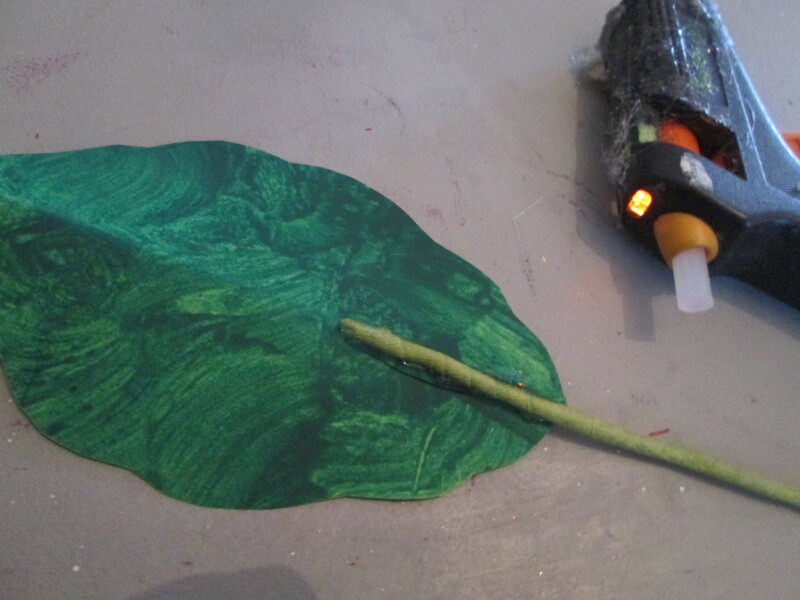 Dark green acrylic paint to give depth to leafs and stalks ect. 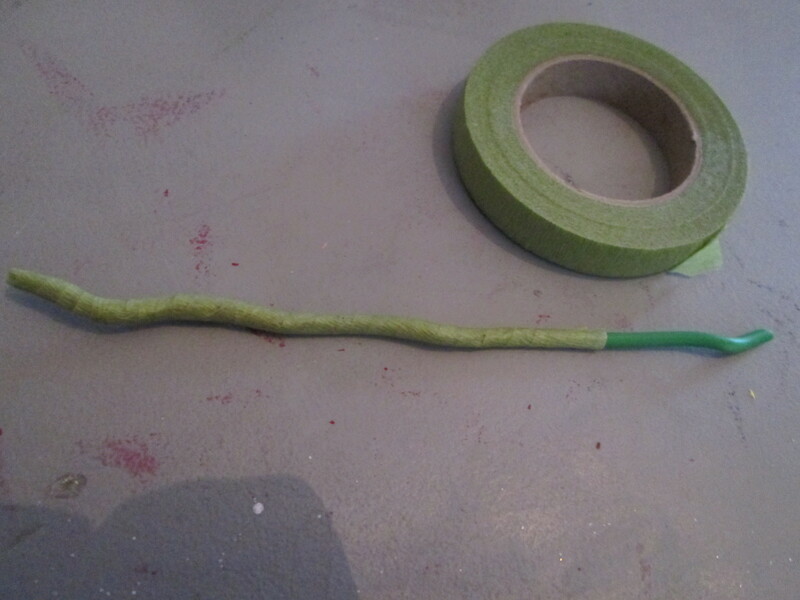 Green florist tape, paper version for painting on. 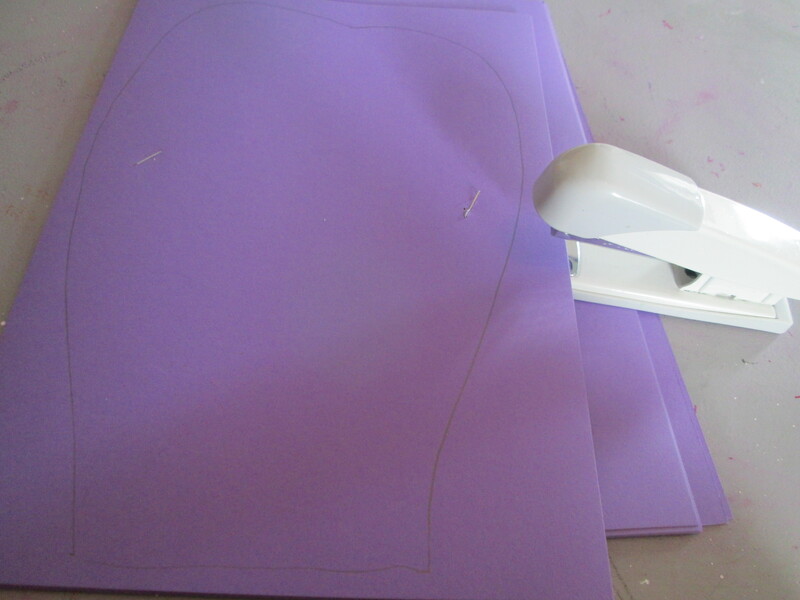 Clean wipe able desk and damp cloth. 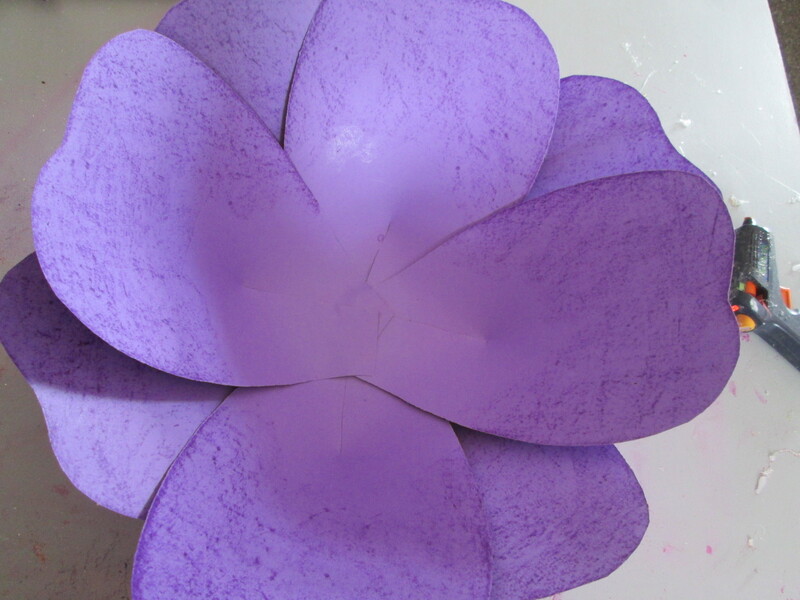 Cut a petal shape out as shown with slit at base to give shape. 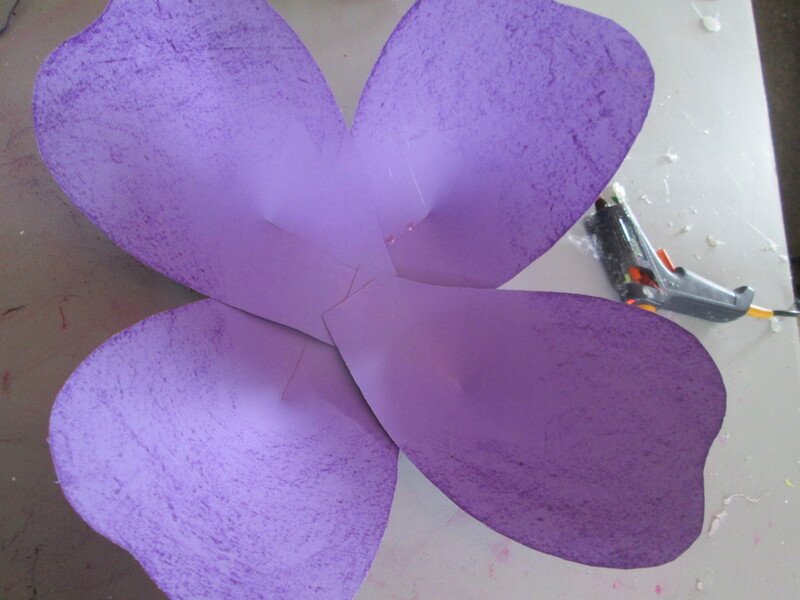 Overlay the slit at the base of the petal and glue to give shape. Glue two of them together as shown. 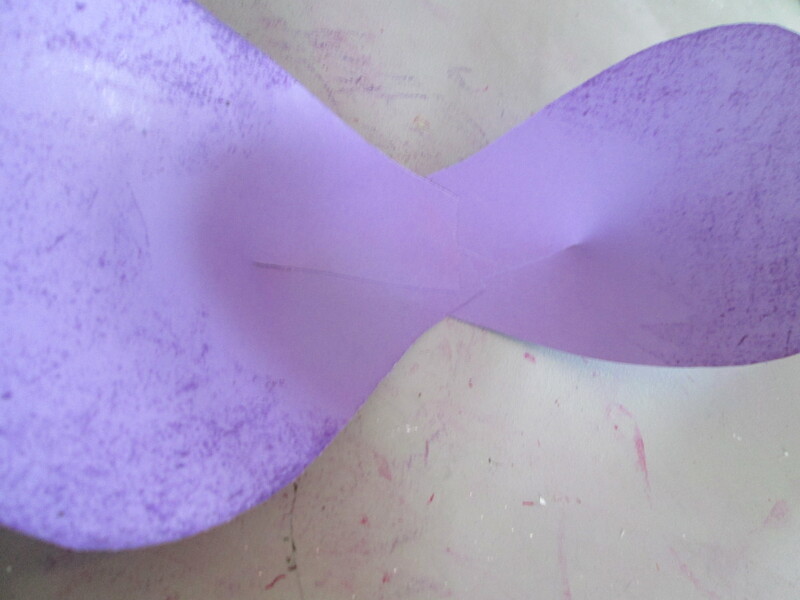 Then glue the other two together and then as four, as shown. 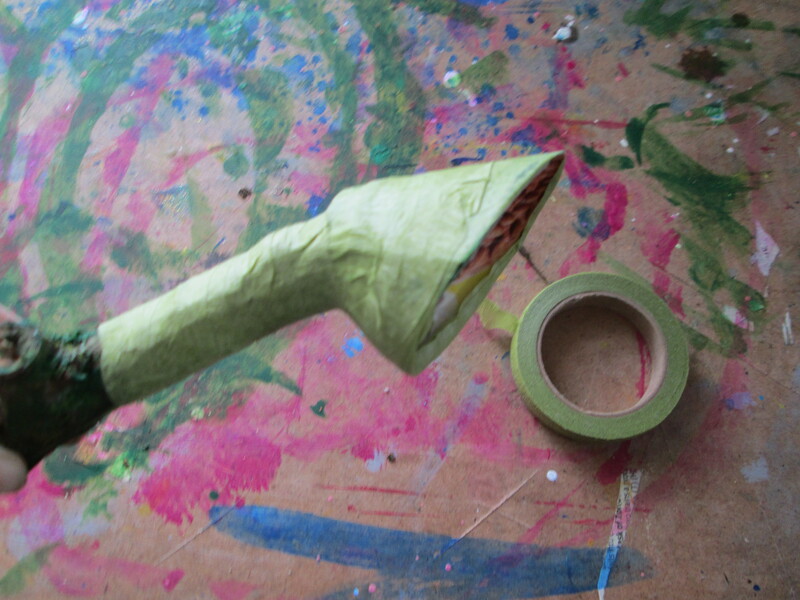 Make another one and glue as shown. 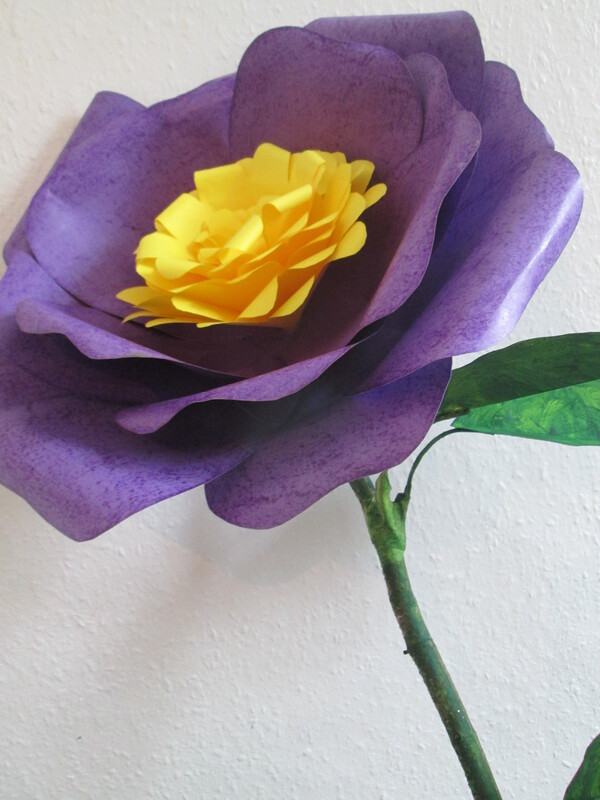 I then added the same but made from 4 x 2 A5 petal form. 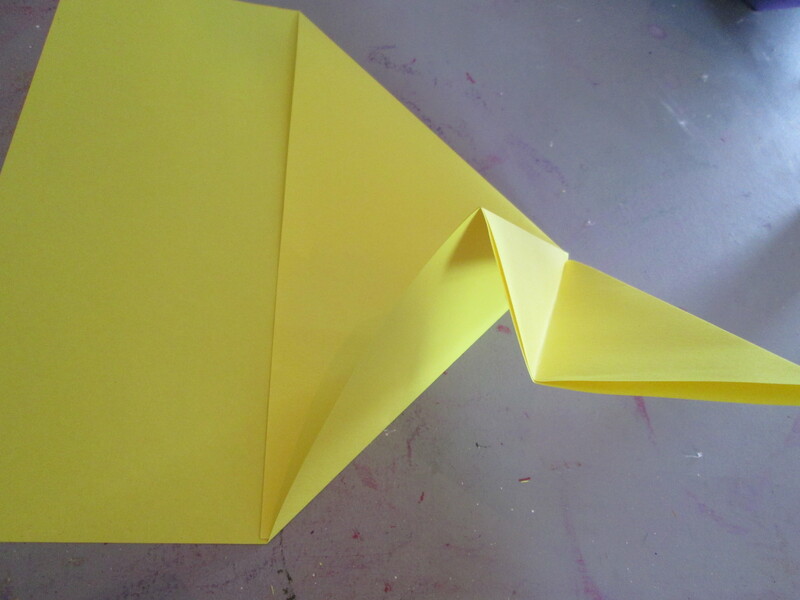 Then to make the pollen, fold a A4 sheet of paper as above. 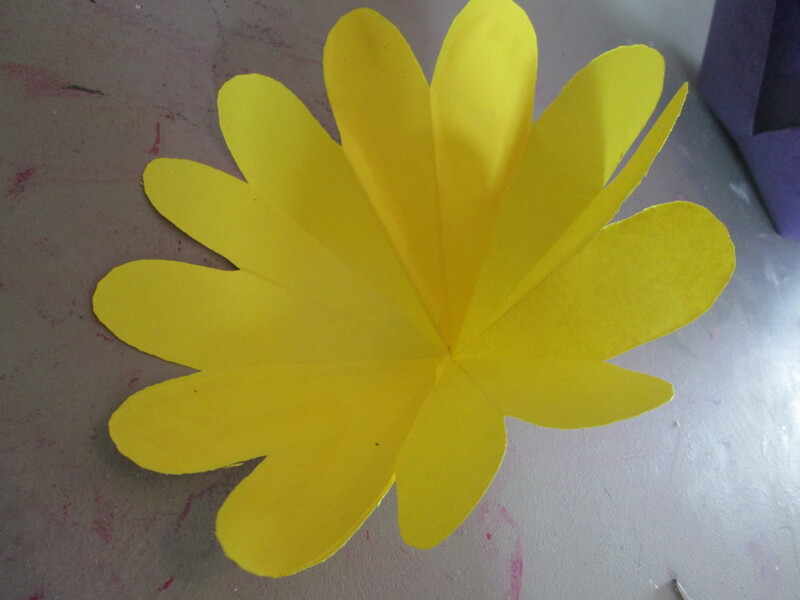 Fold to make 16 petals, You should end up with something like this when you cut the end as above. 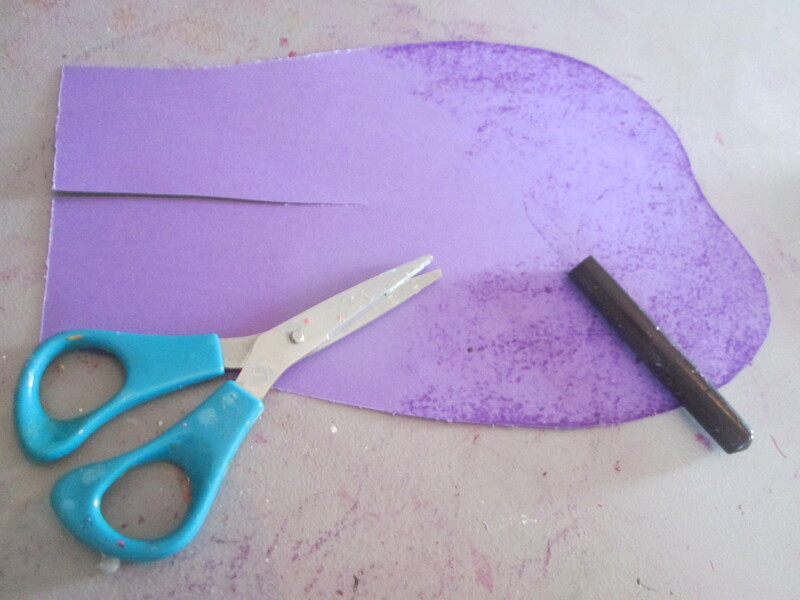 Then cut two pettlas out and glue two as shown. 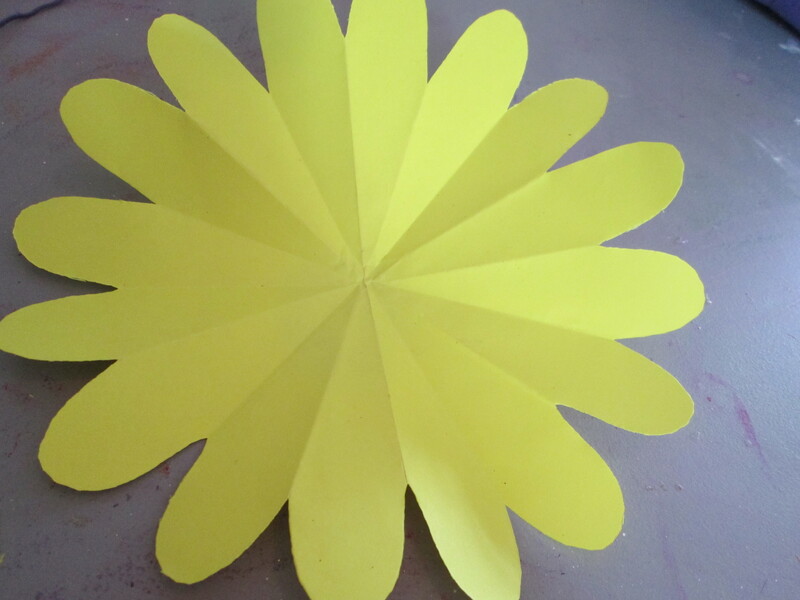 This makes a cone shape for the pollen. 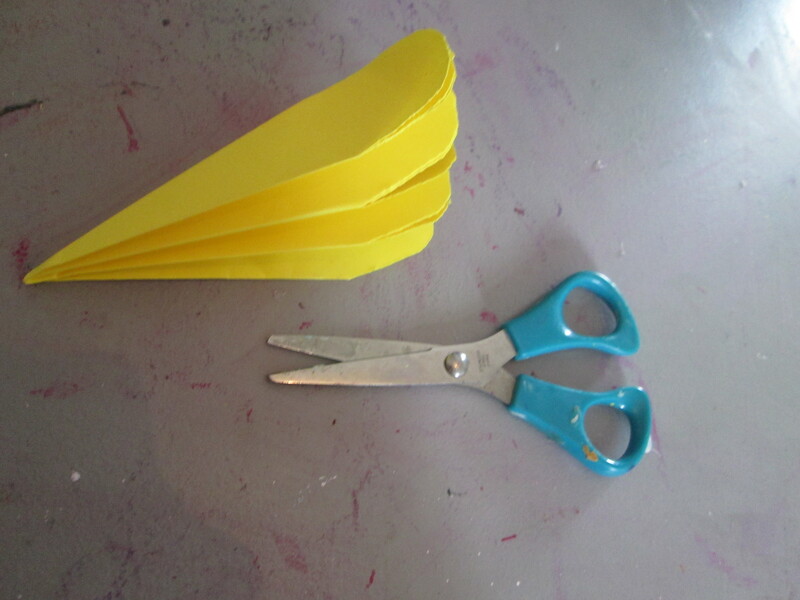 The repeat and make pollen cones as shown. 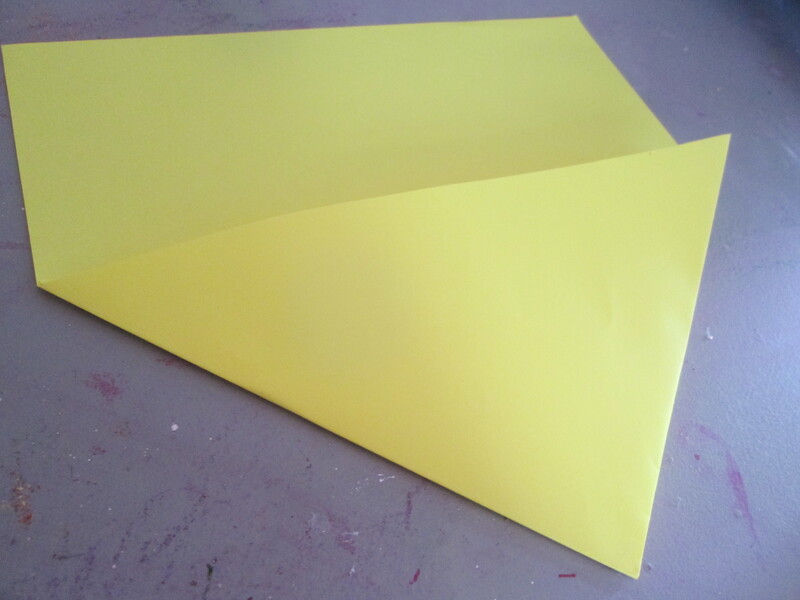 Cutting out more segments on each layer as desired to make a layer of pollen cones, as shown. 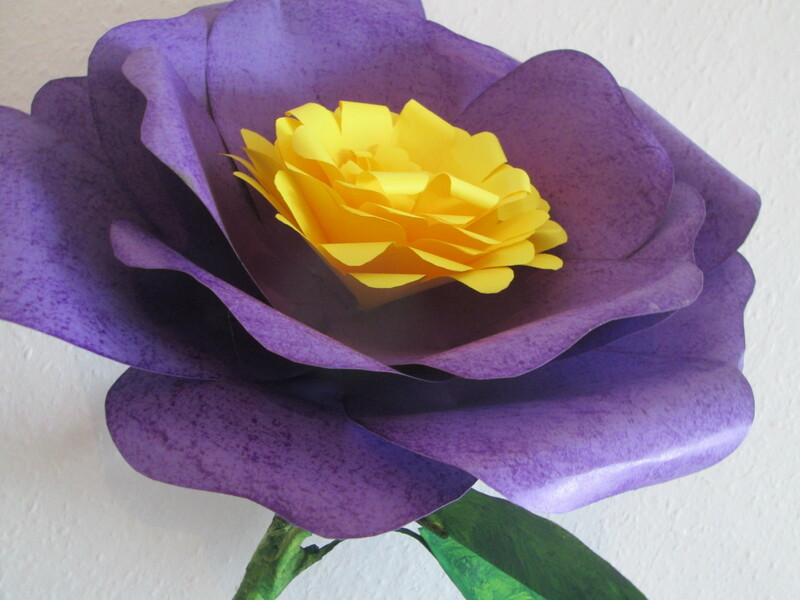 The smaller ones are made with A4 paper. 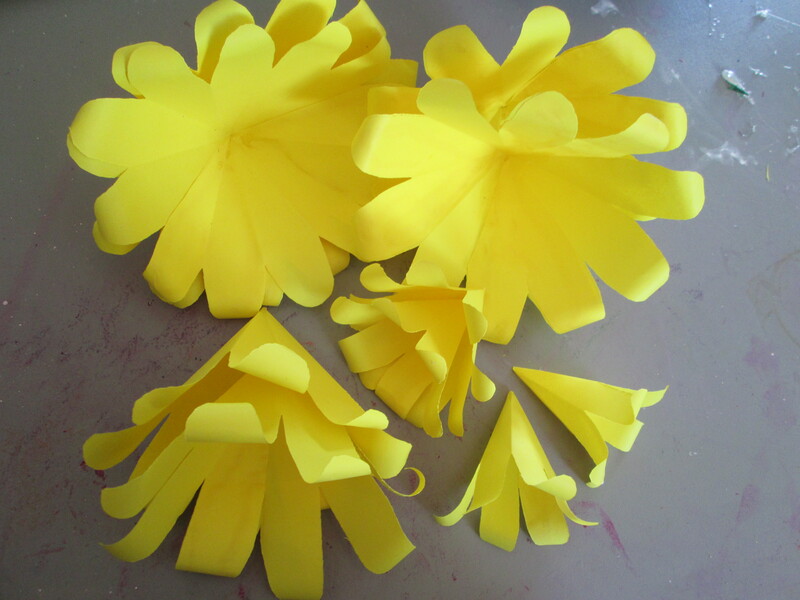 Glue pollen cones as shown one by one into flower. 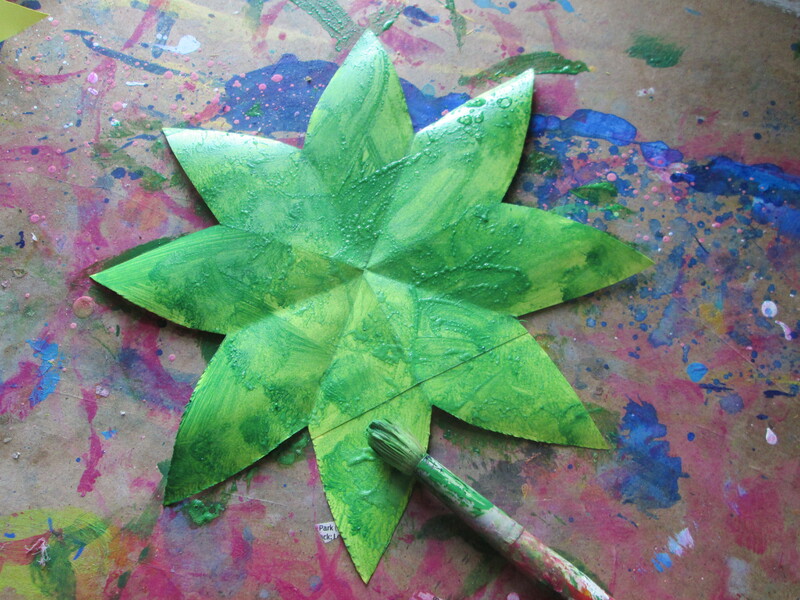 With a A3 green card or painted, make a 8 pointed pointed bud base as shown, with same method as pollen. 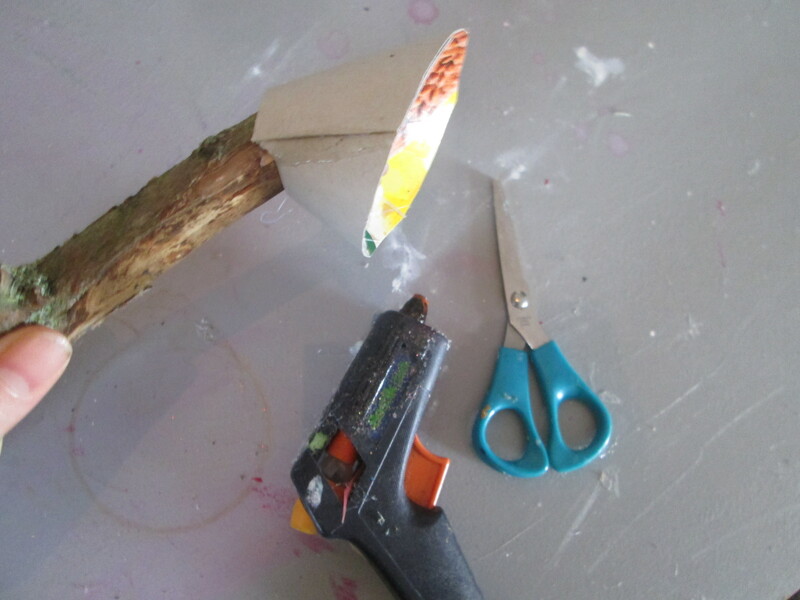 Cut some card as semi a circle with hole in top, glue to make cone, then glue it on to the end of twig. 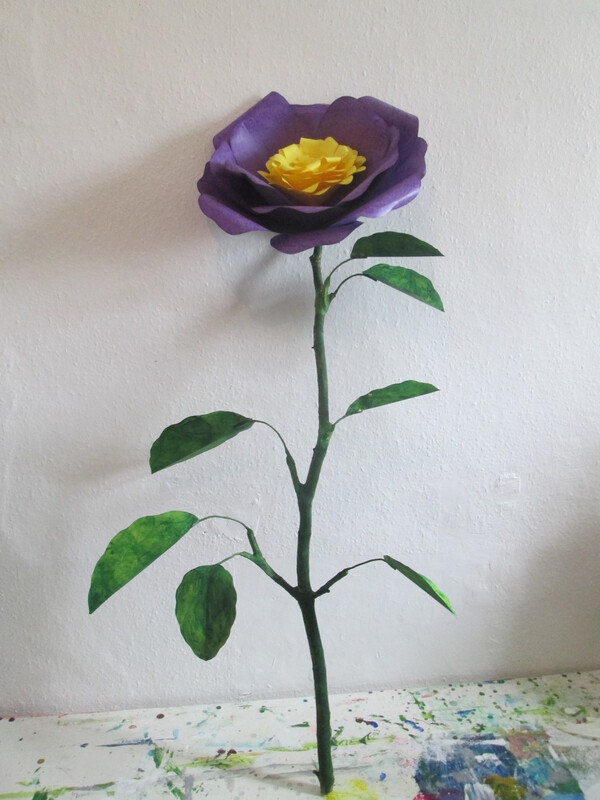 With florist tape cover as shown. 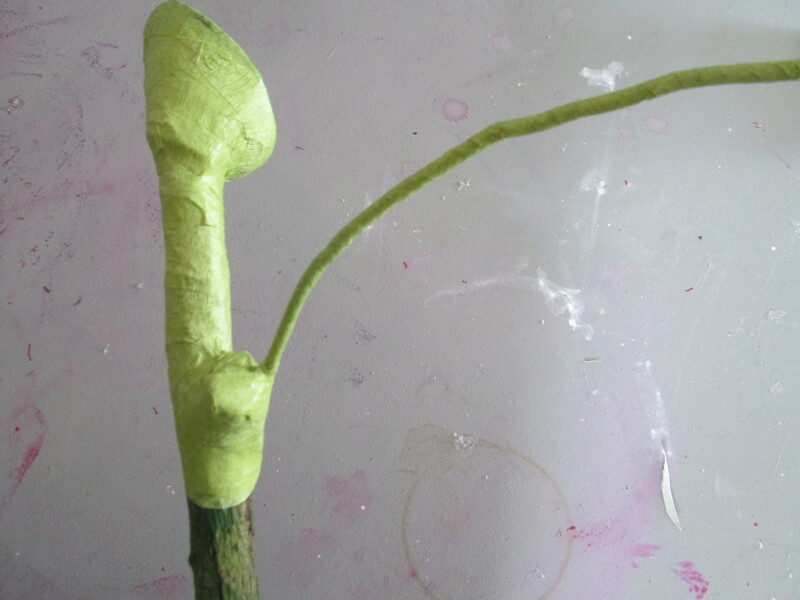 Cover bending wire for leaf steam in florist tape. 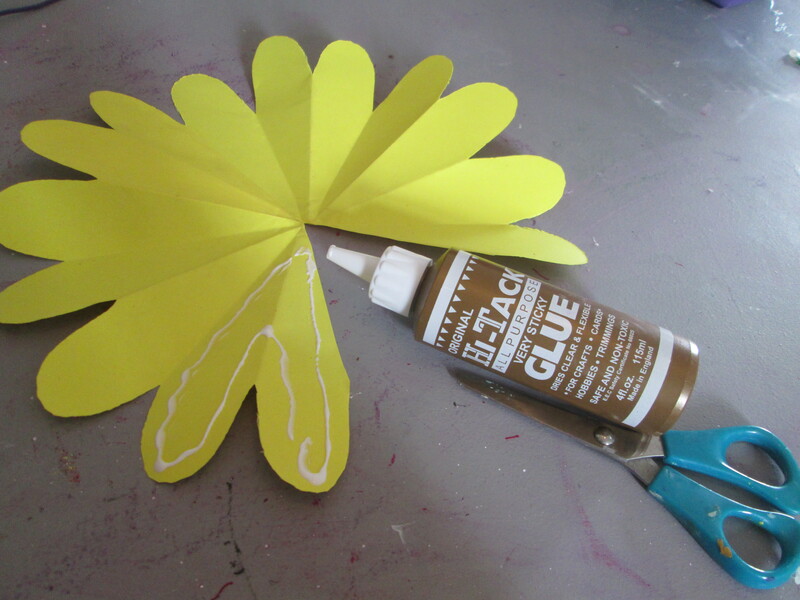 Make as many leafs as desired from A4, & A5 card folded in half cut and folded out and then painted the glue the leaf cut form card as sown. 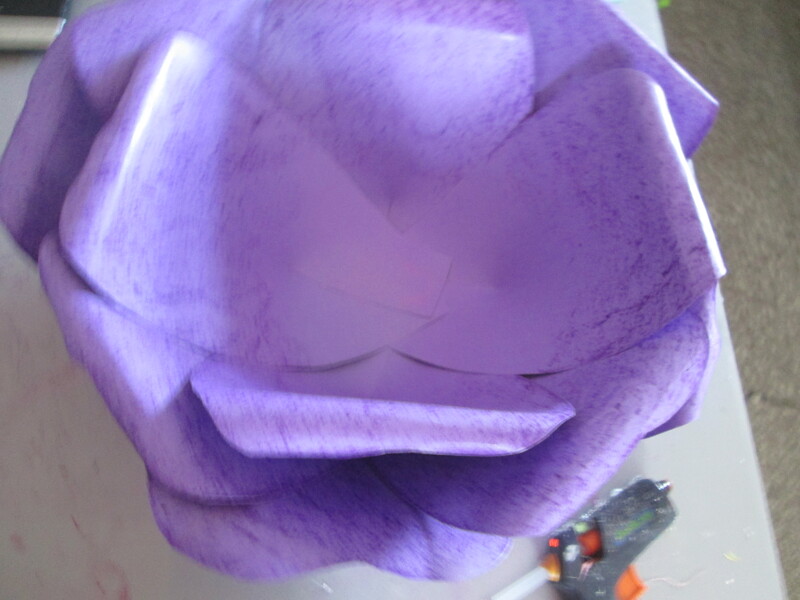 Fix with florist tape a shown. 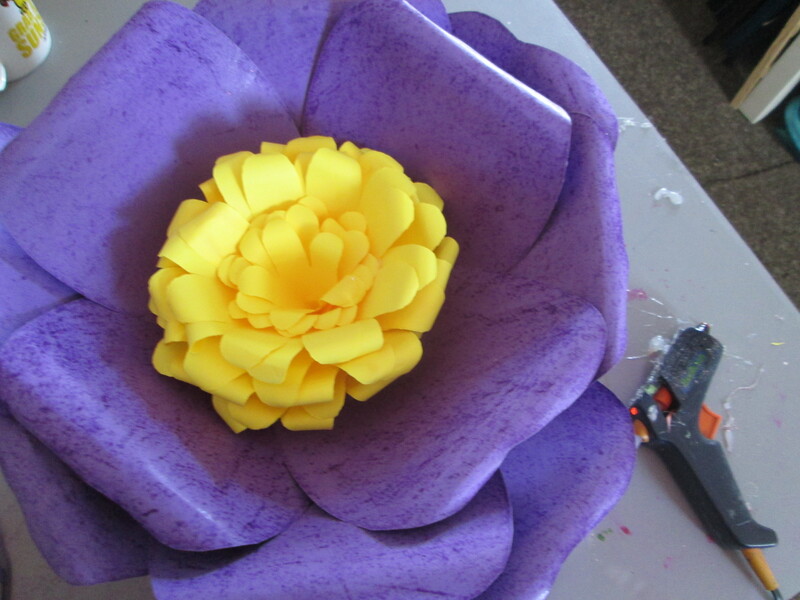 Make and add as many leafs as desired and glue flower base on. 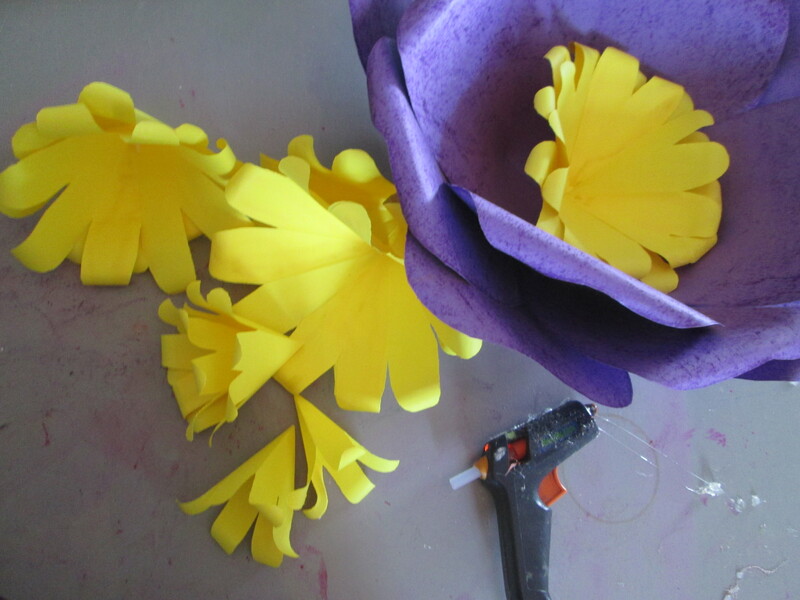 The glue flower head on.